If you want to feel like a fifties movie star then you can't go too far wrong with this 1953 Cadillac Coupe de Ville (their luxury hardtop). Owning a Cadillac in the fifties was certainly a sign you had "made it". Fully loaded, plenty of chrome and luxurious leather seats all screamed, "I'm doing well". It was an icon, a true status symbol of a car and the choice of many celebrities. The Coupe de Ville was part of the Series 62 Cadillacs and in its third generation (running from 1948-53). 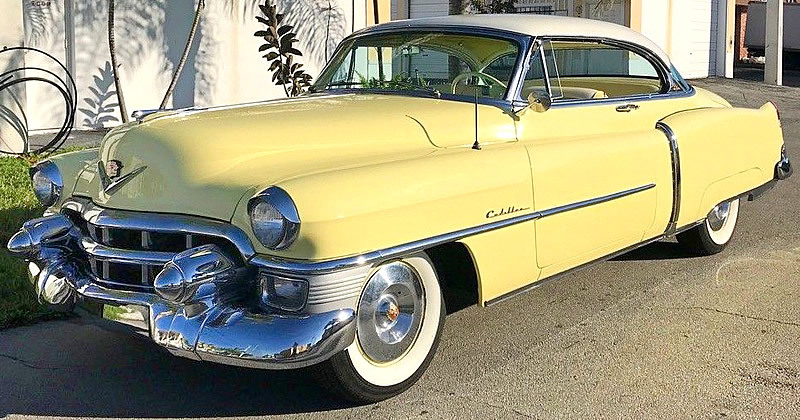 1953 was the first year Cadillac used a curved, one-piece rear window. 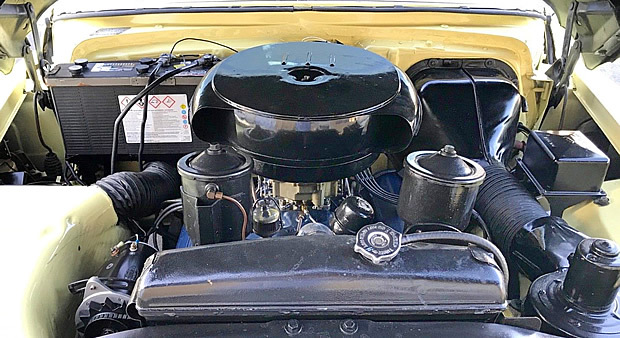 Changes this year also included a bigger, heavier bumper with bullet-like guards also referred to as "Dagmars", the parking lights were now mounted under the headlamps which now had chrome eyebrows and the grille was redesigned. Weighing over 2 tons there wasn't really anyone that outdid Cadillac in sheer big presence. 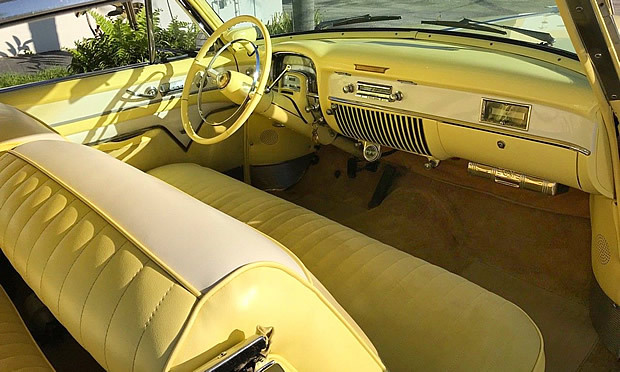 The Coupe DeVille and the Convertible were both a little bit more special with powered front seat and power windows as standard. Those yellow and white seats look like you could just sink into them. "Coupe de Ville" insignia identifies this extra special series 62 car. Additional luxury appears in the form of chrome roof bows - this gives passengers the further impression that you are riding in a convertible. 1953 Cadillac Series 62 cars have a wheelbase of 126" with overall length 220.5" (sedans 215.5") and width of 80.1". Cadillac produced 14,550 Coupe Deville cars for the 1953 model year at a base price of $3,995. This is around double the price a Chevrolet would have cost the same year. Optional extras on this car include a factory radio and power antenna ($100), power steering ($177), E-Z-Eye tinted windows ($46) and Autronic-Eye headlight dimmer ($53). I realize the interior colors are entirely wrong for this DeVille, but I love it! If this car doesn’t cheer a person up just driving it, nothing will! !